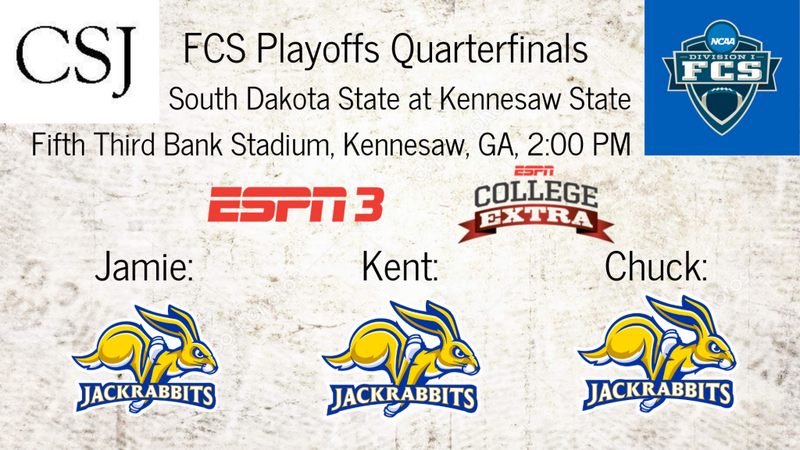 The South Dakota State University football team continues its march through the Football Championship Subdivision playoffs by traveling Saturday to face fourth-seeded Kennesaw State in quarterfinal action. 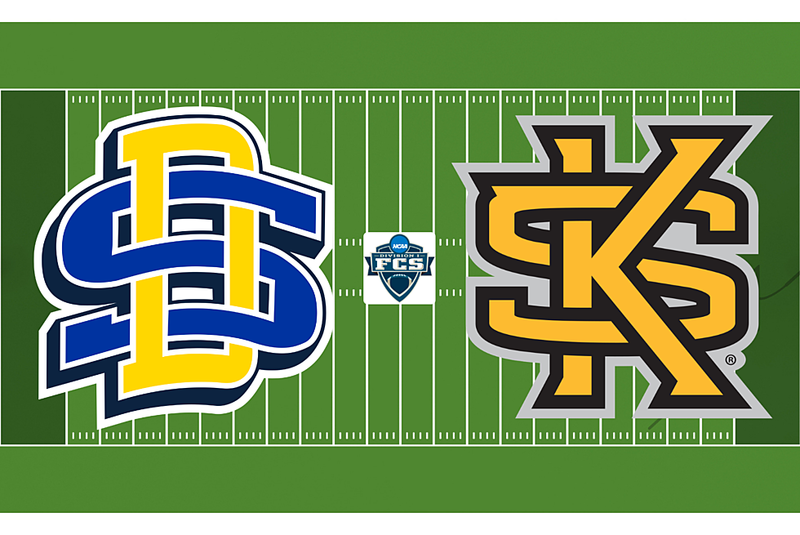 South Dakota State has dominated the second quarter during its current five-game winning streak. The Jackrabbits have outscored the opposition by a combined 96-21 in the second quarter of those games, starting with a 21-0 advantage at Illinois State on Oct. 27, followed by a 31-7 outburst against Missouri State on Nov. 3. SDSU also scored 20 points in the second quarter at Southern Illinois on Nov. 10 and 17 versus Duquesne in Dec. 1 playoff action. For the season, SDSU holds a 155-49 scoring advantage in the second quarter. 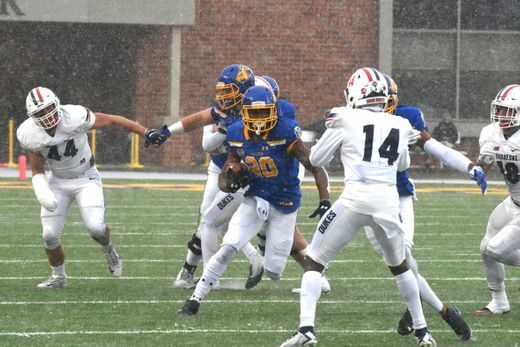 BROOKINGS, S.D.–On a day with snowy and windy conditions, fifth playoff seeded South Dakota State raced out to a 24-0 halftime lead and easily beat Duquesne 51-6 in the Division I FCS second round contest in front of 3,042 in attendance at Dana J. Dykhouse Stadium. Key Player This Week: QB Taryn Christion was expected to put up some great numbers in what was likely his final home game last week, but instead he wasn’t needed to pad his stats – on a snowy day, he was 12 of 26 for 144 yards passing. Don’t be fooled by last week’s box score – in Georgia this week, he is much more likely to be unleashed as the weapon he truly is. Fantasy Bonus Baby This Week:The multi-headed rushing attack of the Jackrabbits will be the key to their success – the question is whether RB Mikey Daniels, who had 100 yards rushing last week and 2 touchdowns (both career highs), or RB Pierre Strong, Jr., who had 93, will be the main guy out of the backfield. That diversity in both the rushing and passing games is a great asset for the Jackrabbits, but a real headache for fantasy sports. Strong Jr. seems most likely to be closest thing to a feature back. 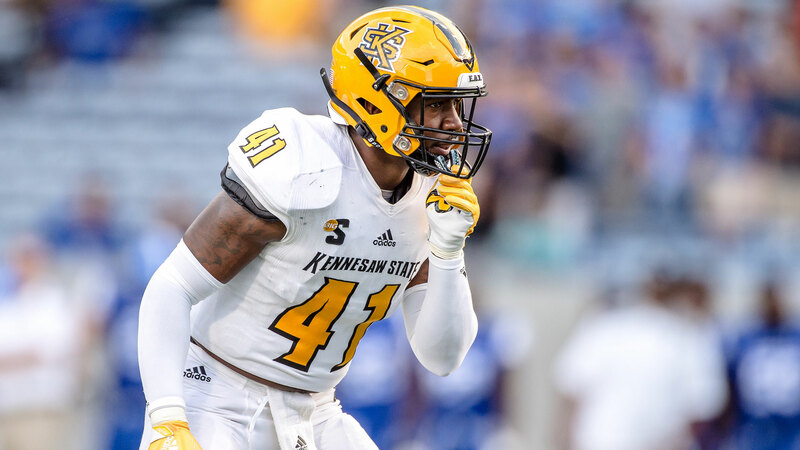 KENNESAW, Ga. – With the score tied 10-10 and 2:10 remaining, Kennesaw State’s Anthony Gore, Jr. sacked quarterback Joe Newman, who fumbled the ball. The Owls’ Andrew Butcher recovered the ball at the Wofford 21-yard line, and four plays later Justin Thompson kicked a 30-yard field goal with 1:52 remaining to ultimately give Kennesaw State a 13-10 victory. In a game touted as a matchup between two option teams with prolific rushing offenses, it was defense that was the story of the day with both Wofford and Kennesaw State being held well under their season averages in rushing. The Terriers were held to an average of only 1.7 yards per carry, while Owls QB Chandler Burks was held without a touchdown for just the second time in 16 games. 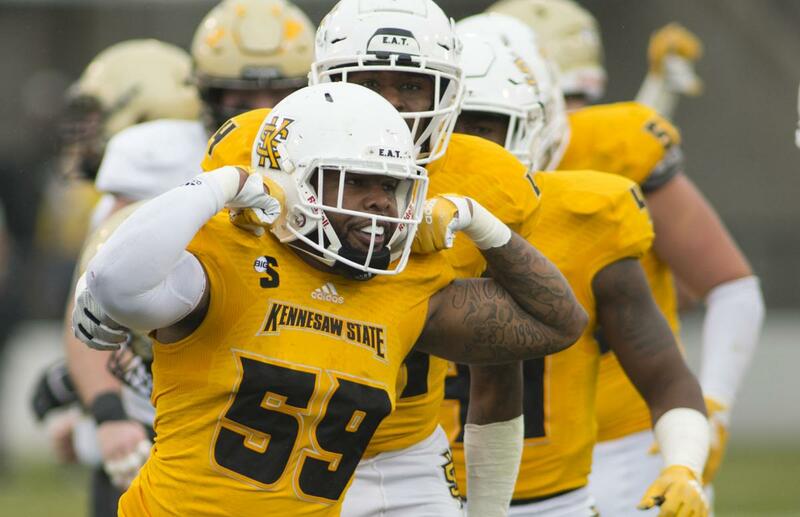 Key Player This Week: Can LB Anthony Gore, Jr. and the Kennesaw defense stifle the Jackrabbit offense the same way they bottled up Wofford? The Owls have only given up 107.6 yards per game on the ground all season, but perhaps even more impressive was the fact that they held Wofford, one of the most prolific FCS rushing teams in the nation, to only 74 net rushing yards on the game. They’ll need to do it again this week in order to beat South Dakota State. Fantasy Bonus Baby This Week: Last week, for the first time since forever, QB Chandler Burks was held without a touchdown on the ground by Wofford’s defense. The Jackrabbits, who only allow 154.2 yards on the ground defensively, will certainly be looking very closely at last week’s game film to see if they can also hold Burks touchdownless. But how likely is that, really?